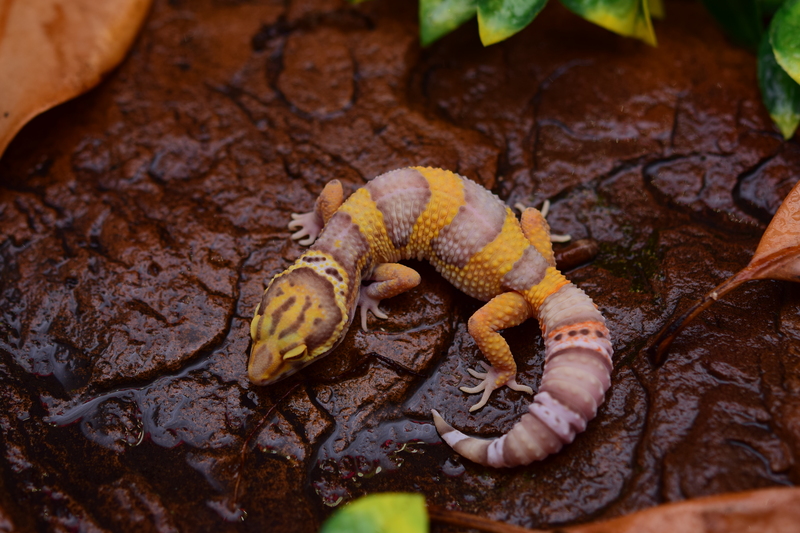 The goal here is to get accurate, unbiased, and up to date info on leopard gecko genetics. This is not so much a genetic outcomes page (plenty of those), but a resource for the understanding of current morphs and lines in leopard gecko breeder hobby. As a lot of us know the market has turned into a hodgepodge of anything goes when it comes to morphs and names. Almost all of these being line bred projects, which just adds to the confusion for people people starting off. The ambiguity of these line names has even been used as a deceptive marketing strategy of some not so trustworthy breeders. I talk with a lot of breeders on a regular bases, and have pretty extensive first hand experience. What I don't know I have asked, and most of this page has become a consensus effort. In no way is this page close to being done, but it's a start. I'm open to suggestions and criticisms, as I don't want this to be in any way a one sided thing. First Off, What is Pure? I wanted to start off with a little thought on the meaning of "pure". These days we see this being label being dropped all too often without thinking much about the true meaning. First, there seems to be two definitions that have emerged for the meaning of "pure". The first instance where pure is used is an animal that contains no other hets besides the visual appearance. This means if you have a pure Eclipse for example, then it should only be Eclipse and not het (or homozygous) for any other genetic traits. This means that you have test bred the line thoroughly, or it comes from a VERY reputable source that has a proven track record of testing their animals. All too often someone will buy a gecko from a breeder and not know what other hets the gecko might carry. Even being so, they still will sell offspring as "pure" without test breeding it for themselves. This is a dishonest (or ignorant) practice, and only causes more problems down the road. Fortunately these "breeders", if you can call them that, usually don't last too long. The second example of labeling a gecko as "pure" is when applying it to a specific line of gecko. For instance, pure Firewater, pure Solar Raptor, pure Pastel Raptor, pure Bandit, etc. In this case to apply the name pure you must have animals that are 100% from that line. This doesn't mean you cross a Pastel Raptor with a Extreme Emerine and you produce Pastel Raptors. Although these names are geared towards marketing they do represent specific lines of geckos and should be honestly represented. A lot of breeders have been making crosses of various morphs while continuing to label the offspring as one specific line (usually the better of the two). This is another very dishonest approach to breeding and/or selling geckos. Patternless Stripe - A very confusing aspect of Eclipses. Seems to be randomly associated with eclipse yet can be line bred away from showing up as often. Can be present in het eclipses as well as visuals. High White markings: Nose, feet, and tail are most common. "High White" Eclipses can even display into the neck and body. Note these are not pied geckos as some have marketed. True pied should be a separate gene and not a random by-product of another. Eye Pigment - Note: Background color of eye is white with some red veins even without albinism involved. Snake Eye = 1-99% partial pigment in eye. No eye pigment Eclipses: Also called clear eyes, Abyssinian -etc. Separate eye pigment gene from eclipse. Should never be mixed with eclipses or poss het eclipse geckos. Doesn't seem to affect body color as much like eclipses do. Also, doesn't change background of eye color like Eclipses do. Eye pigment from the Gecko Genetics line tangerines. **It seems that all visual females are infertile (Please message me if you have produced viable offspring from a visual female.) Can cause eye deformities usually characterized by small eyes. Seems to not affect eye sight or well being of the gecko either way. Gene also acts as a color intensifier. Noir Desire Black Eye (NDBE) aka Noir Desire for short, was discovered stemming out of the Gecko Genetics line tangerines. When Jason sold off his collection 2 males were found to have carried the gene on. One went to Designer geckos and one went to GeckoBoa Reptiles. Offspring sold to European breeders (Lydie Verger & Fran Lhotka) from Designer geckos exposed the gene for the first time in that line. John at GeckoBoa Reptiles had noticed the gene pop up around the same time but wanted to do some more test breeding before any public announcements. It has since been proven that the gene acts recessive. Characterized by large size that can be genetically passed on to offspring. There has been a long and heated debate on whether the gene is incomplete dominant, recessive, or line bred. My opinion: ​ I personally feel it is best described as a recessive, but may in fact be line bred. Very hard to find and prove true Super Giants. A lot that are labeled SG are just overfed normals and mixes. Serious test breeding and honest feeding regimes must be taken to ensure true SGs. Unfortunately, overfeeding for weight has taken it's toll on many of these geckos. All the "record breakers" seem to have died within a couple of years. Best to not solely look at the scale and go for length instead. The scale can be used in a more accurate way if feeding is not overdone. Neurological issues associated with the gene. Efforts to remove the disorder have proven unsuccessful over and over. Be very careful of breeders claims to no "Enigma Syndrome" (ES). I personally won't work with them anymore due to the issues. Prone to developing malignant iridophore cell tumors as age sets in. Increased iridophore pigment cell imbalance causes morph coloration but also seems to be the cause of the iridophoromas. Mixing in lighter colored morphs such as hypo tangerine seems to increase symptoms. No evidence that it can be separated from the morph as what causes the unique coloration is also causing the tumors. No LF siblings ever show symptoms. Supposed to not have a super form but when bred to a Mack snow supers can be produced. Supposed to not have a super form but when bred to a Mack snow supers can be produced. Possibly these are just rebranded Gem Snows. Hard to prove otherwise. Albey's line of line bred snow has possibly been shown to be a dominant gene. Probably one of the other snows, or strong line bred genetics. I have limited experience with this gene, so I will refer to an article from another breeder. I can't vouch for it's complete accuracy, but I have worked with the Ray Hines ghosts in limited numbers and they seem to act dominant . Ghosts article. Super Snow - Homozygous version. Note: Bulleted points are lines or project names, not morphs. Lacking black pigment along the back. Can act dominant. *There are as many Tangerine and Emerine lines as there are breeders. Most are just variants of the ones seen below. These are some of the more commonly seen ones. Purple blood - Line of Pure Bloods that came out of Sin City Gecko' s(Nathan Jamieson) groups. Blood Hypo- Blood mixed in with hypo genes. - Mandarin - From Gecko Genetics line. Inferno - Luxurious Leopards line consisting of Albey, TUG, and Electric lines. 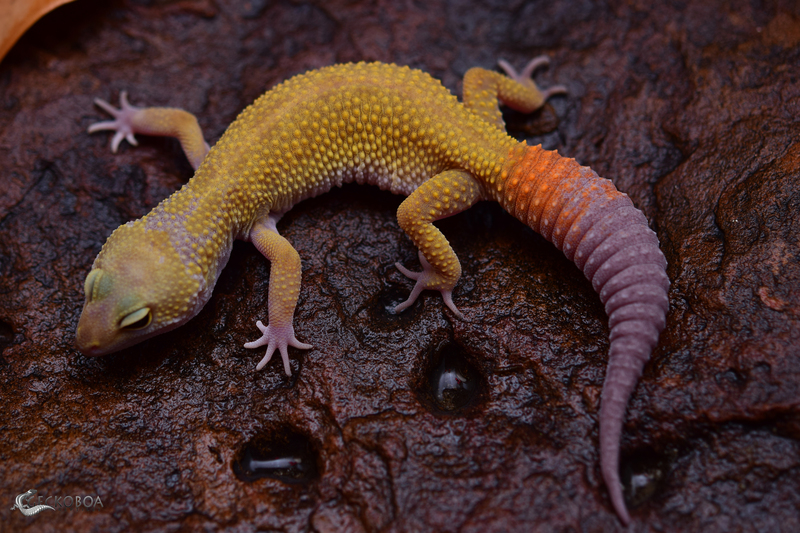 Hot Gecko Tangerine - Tangerine line originated by Dan Lubinsky. They descended from a pair he purchased of Ron Hatcher in '95. Tangerine line that makes up firewater line. Emerine = Attempt to line breed for green coloration. Usually just tangerine variants. G Project - Line bred tangerine from Matt Baronak. Came out of A&M's rainbow stripe projects. - Clown G - G Projects and Electrics selectively line bred together. Lavender = Any line bred VERY high-lavender gecko. Lavender Bells- Paul Allen line. Rainbow Stripe - Line of striped and reverse striped geckos originally bred by A&M gecko. Characterized by orange and green coloration. Foundation to other projects such as g project. Red Stripe = 2 highlighted stripes that highlight the inner stripes along the dorsal line. Typically brighter orange in color but can vary. The inner stripes typically develop around 4-6 months of age and dull out a little into adulthood. First discovered by High Quality (HQ) in Canada. Another early group stems out of JMG Reptiles. Patternless Stripe = Patternless or reverse striping associated with the Eclipse gene. A&M created some by crossing reverse stripes to their stripe lines. Possibly this created het eclipses from which a new line of eclipses and raptors began. Other ideas suggest hets floating down through the line. Hyper Xanthic - Developed by JMG reptiles, they are characterized by florescent yellow coloration and high contrast markings. Pastel/ Pastel Raptor - Developed by Ron Tremper originally form his Blue Belly Project. Note: There is some confusion regarding the exact correct definition of sunglows. The old school definition is SHTCTB albino lacking all spots along the back. It is however common to see sunglows with a few spots but they should be more of the super hypo variety to be called a true sunglow. Tangerine Albino = any one of many tangerine albino combos. Pastel Raptor = Line of Raptors bred for unique pastel colors. Should be 100% from original line. ﻿Solar Raptor = G project Raptor. Should be 100% from original line. 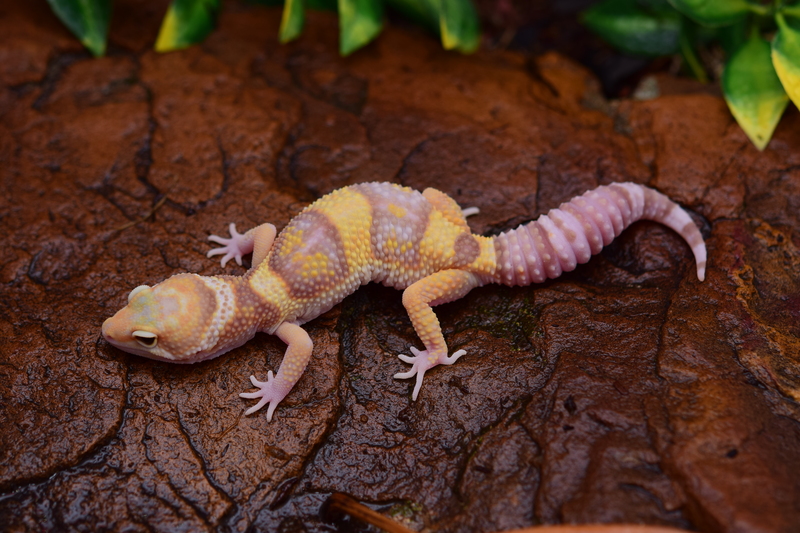 Tangelo - Line of tangerine Tremper albinos originally thought to act co-dom or recessive. Most agree that it is line bred like other tangerine lines. Red Diamond - Tangerine Tremper that originates from Italian breeders Carlo Maia and Luca Gonzini. Carlo originally bred a Electric/Bandit cross to a Ultimate gecko line Tangerine W/Y and produced a nice striped gecko from the pairing. He then paired her to a Blood sunglow het Raptor from JMG. At this time he was downsizing, so he sent the project to Luca who then line bred them to what they are now. Note: Sunrise and Sunsets derived originally from Blizzards crossed into Tangelos. Extensive further test breedings have confirmed the tangerine acts as a line bred. Sunsets and Sunrises should come from the original Nick Stark line. Raining Red Stripe = Red Stripe Rainwaters from original Jeremy Letkey line. Lava line - Lava, an exceptional Firewater produced from the combined efforts of HISS and Bryan Jett. "Lava" has proven to produce some of the nicest Firewaters out there. Jungle Giant = Unique line of Jungle Giants from A&M gecko. no doubt that we see influence from these animals showing up in many lines today. Stonewash = Unique geckos with "stonewashed" appearance developed by JMG reptile. Diorite = Only on here for informational value. Super Snow line bred for speckling. Possibly het for Blizzard or Murphy. Note many of these names were originally created to market a combination of base morphs as a new morph. They can be useful in shortening up names and one should be familiar with them whether they use them or not. I have listed the common ones seen in the hobby although some have tried to tag more combos with their own versions of names. Most of these others are desperate attempts to market their animals and are not worth noting. Note: Creamsicles and Snowglows need many years of line breeding tangerine into the snow line before they should be called one. These are to represent the very best of these line bred animals. Creamsicles were pioneered by JMG reptiles and traditionally came from those bloodlines. The Raptor originally started off as an acronym for Red eye Albino Patternless Tremper ORange. Now it is commonplace among most breeders to say any Tremper Eclipse is a Raptor as these are the only components predictably inherited. Sometimes you will see geckos labeled Banded or Jungle Raptor to distinguish pattern. It is also fine to just label raptors as "Tremper Eclipses". Note that many will only call the patternless version raptors. Either way it doesn't matter as people will debate this until the end of time. Just be aware that the debate exists and it doesn't really matter since it is just a random visual difference that distinguishes them. Good luck! Marketing name not commonly used anymore but can be used to describe this variation. Tremper het Eclipse is typically what should be used as the patternless is highly variable. Care must be taking when breeding these as eclipse can hide behind the Blizzard gene thus making it indistinguishable from a non eclipse. Plenty of DBs being sold these days are really just Blazing Blizzards. This article will be specifically targeted toward leopard geckos but it's principles can be applied across the board of breeding reptiles. Recently ethics when breeding has become a real hot issue among breeders and hobbyist alike, and although it is usually laced with arguments and a lot of drama, I feel it's best that I discuss proper breeder ethics from a medium to larger breeder's point of view. Some may agree or disagree but I speak in fact and get down to the real issue which is irresponsible breeding. I have no biases or personal motivations when writing this but only wish to get out the proper information to the entry level breeders and hobbyists. Most that know me know I venture as far away from the drama and the he said she said as possible. This doesn't mean I don't have opinions or that I'm scared to speak my mind, but rather I find this particular part of the hobby especially distasteful. My motivation in writing this is only to help change this around for future generations and to set the record straight now rather than when it's too late. First off I will start with the important rules in breeding leopard geckos to sell as breeders and not as pets as I get these questions almost on a daily basis. Again these rules apply to breeding to sell and for future breeding stock. This does not apply to testing animals or for the pet trade. -Do not mix any of the 3 Albino strains(Tremper, Rainwater, and Bell), including hets, with each other. Once mixed they might never be able to be distinguished. I don't care how experienced you are, the albino strains can never be 100% accurately identified from each other. Another factor is quite a bit of their distinguishing appearence comes from the background genetics at play and not specifically the albino involved. -Do not mix eye pigment traits. This means do not mix Eclipse, ME, and in certain cases be careful of how you mix Blizzard and Super Snows with other eye traits. If you were to mix for example Eclipse and Blizzard you have to breed Eclipse het Blizzards or proven Eclipse Blizzards. Otherwise, how can you know for sure it's an eclipse? For example in creating Diablo Blancos you have to breed visual eclipses het DB or proven DB's because the eclipse can hide behind the Blizzard gene. In cases where this does not happen these geckos should always be labeled as possible het eclipses but usually this just passes the problem on to the next guy. Same goes for Super Snows especially when mixed with albino. Marble eyes should ONLY be bred to animals that have been proven not eclipse or het. Can't wait for this mess to pop up in the coming years. -Do not mix the 3 genetic snows. Mack, TUG, or Gem and possibly the line bred snows as well. We might already be too late on this but hopefully we can deconstruct these and have known pure snows again. In my opinion mixing snows is just as bad as albinos if not worse because of how frequently it is done without consequence. If these snow lines ever prove out all the same in the future then this rule will not apply. My feeling is they are similar genes that lie on the same allele yet can have different super forms. Actually not that uncommon in genetics. These are the main rules to follow. There are others that can be considered just bad breeding choices but usually they can still be sold and bred in the future. Breeders wishing to breed, for example, a gene that is found "locked up" in one albino strain must deconstruct the unwanted albino and isolate the desired gene correctly. This means not cutting corners and spending the extra years of work to isolate the gene. For example the Marble Eye trait was found in Tremper albinos and has taken many years of breeding and the use of wild types to isolate so it can be bred into other albinos. The lazy breeder who doesn't care might cross them directly to a Bell and try to create ME Bells in two years. This leads to a disaster in all geckos related to these original animals as 66% of them, will in theory, be het Tremper. Here you can see how one breeders laziness can affect hundreds if not thousands of geckos down the road. Never hurts to ask the breeders how they specifically created their combo morphs. I keep very detailed records of all my animals and exactly where they came from and I have no problem disclosing this info. My records are so detailed that I know not only every gecko that is related to every gecko I own, but I also know every test breeding I have done with all of it's relatives and what or what not was produced. This means I can go back many generations and I know what every parent has been bred to each year and what exactly was produced. I do this partly by written documentation but also by hundreds of thousands of photos that provide a visual documentation. If a breeder can't do this for you they probably are sloppy and maybe you should do business elsewhere. Now the question arises of test breeding every animal you have in your collection. The sad part about this is that all larger breeders currently have unknown hets floating around. There's just no denying it and if someone says that everything in their entire collection is pure they are either lying to you or they only have a couple lines of geckos from tested genetics. The fact is that even if a breeder is trustworthy they may have purchased an animal from another breeder who did not label their animals correctly or they crossed conflicting hets knowingly or not. Nobody is immune to this! My personal opinion is that you should always do the best you can. I'm not saying to test breed every animal to every albino strain but make sure you do your homework and buy from trusted sources and get all the background info on the animal including ALL the possible hets. I don't care if there is a 2% chance of being het albino it should always be documented and disclosed. Also make the smart decisions when breeding. It's a fact that the tremper albino strain is the most common and should be usually tested first. Depending on the animal purchased and from which breeder can influence what should be tested. 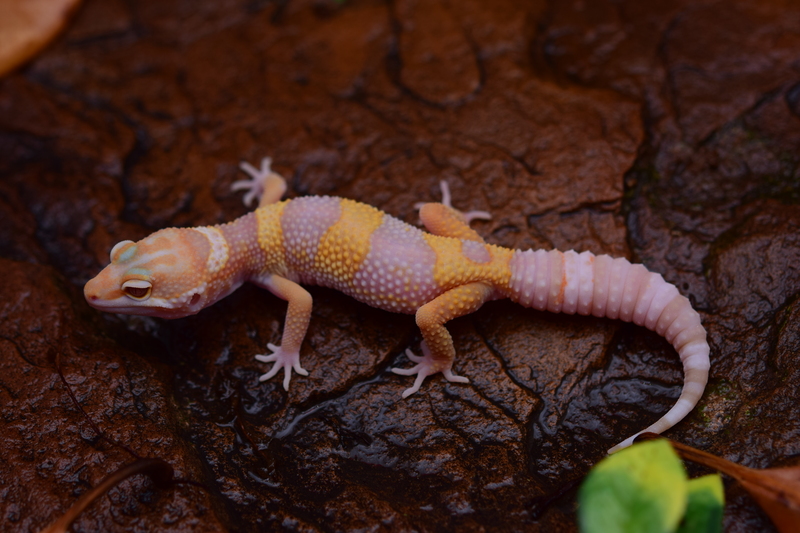 For example if I get a gecko from Tremper directly I probably will test for Tremper albino. I am currently testing all my main breeding males and most of my founding females. It's not something I want to do but at least I will sleep at night. Now on to the controversy of test breeding and creating more mixed multi-het animals. The bottom line is that we must as a community of breeders and hobbyist separate the pet store trade and the breeder trade as two different classes of geckos. Geckos can go from the breeder trade to the pet trade but should never come back unless they are extensively test bred. This means if you go down to any chain pet store and find a nice looking gecko you should under no circumstance breed these animals into your trusted breeder lines. Almost every gecko that you see at your big chain pet stores has hidden hets and it's not like these animals come with a genetic ID card with the purchase. It's the same as picking out a dog at a shelter that looks like a pure breed and breeding them into your champion blood lines. You just don't do it. If you take it upon yourself to breed "pet store geckos" together then you must sell them as pets as well. So that being said what do you do with all your "test bred" animals that are a mix of hets? Under no circumstance should you just cull the animals. There is just no reason that we should take animals and breed them just to see if there is an albino just to kill them. Seriously, what have we become as breeders if we do this? All these geckos will make great pets and should be allowed to enter the "pet trade" which is a much larger market. Again the pet geckos we always see come from mass production facilities with all kinds of hets floating around anyway. These VERY LARGE high production breeders produce hundreds of thousands of geckos for the pet trade each year and do you think they keep perfect records of each gecko heading out the door? Absolutely not and when these geckos with a slew of hets enters the pet shop market there is no difference between them and our test bred animals. That is why you spend a couple hundred on a gecko from a reputable breeder and have it shipped for almost double the price of these unknown origin pet store geckos. I wish I didn't have to spend over $100k on my collection but that's the price I paid to get quality. Anyone that argues with this shouldn't be breeding in the first place. This article is not to discourage anyone from breeding leopard geckos but in fact it is the exact opposite. It is a wonderful hobby and I am so happy that I am able to be part of it. If things are done correctly and we all work together to clean these lines then we will have sustainable hobby for future generations. Always do the right thing and keep this hobby strong. Below are examples of how basic Mendel genetic inheritance works with leopard geckos. Notice how similar the three most common types are but the visual representation is what changes. Homozygous is synonymous with "2 copy" and "super".